Over the past few months, many have been operating under the assumption that the upcoming pickup version of the Jeep Wrangler would be called the Scrambler. But now a “long-time trusted source” of the forums claims to have spotted a screenshot of the company’s website listing the highly anticipated pickup as the 2020 Jeep Gladiator. The long-time trusted source’s screenshot was emailed to us by JeepScramblerForum, which seemingly needs to change its name to JeepGladiatorForum soon. The source on the forums claims they saw the name on Fiat-Chrysler’s media site, listed as the 2020 Jeep Gladiator, on both their iPhone and their computer browser before the listing was apparently taken down. 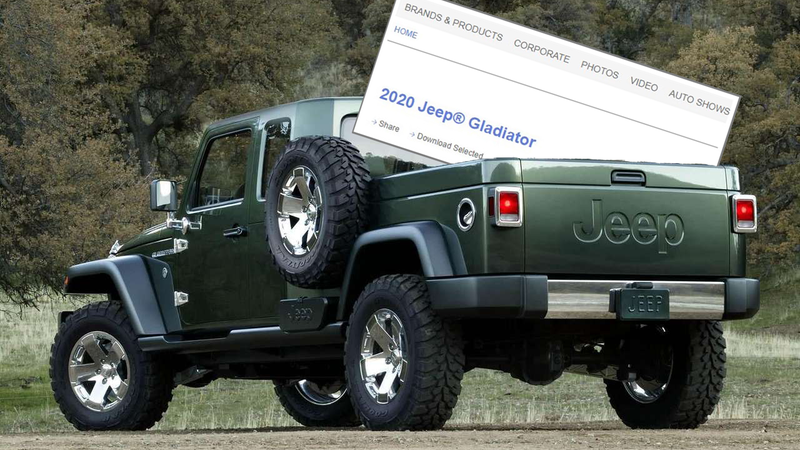 If you search the media site for “Gladiator” now, all that comes up is a press release for the 2005 Jeep Gladiator pickup truck concept. Previously, the “Scrambler” name for the new truck was assumed due to the “JT” model code designation, which it shares with the previous Jeep based pickup of the same name. The forums also claim to have confirmed three additional pickup codes for the truck, Sport Pickup JTJL98, Overland Pickup JTJP98 and Rubicon Pickup JTJS98, suggesting those will be the trim options. Last month, a press release for this year’s LA Auto Show mentioned the reveal of “a pickup truck from Jeep,” so we’ll know at the end of this month if the forum source is right about the name. Either Scrambler or Gladiator or whatever, Jeep is going to sell so many of these things. They could have called it the Fumbler and people would still be lining up to trade their 2017 regular Wranglers in for it.